In the southernmost part of Essex County, there is a beautiful resort town with a rich history and picturesque rocky coasts. That town is known as Nahant, Massachusetts. Situated in eastern Massachusetts, south of Lynn, the Town of Nahant is a peninsula surrounded on three sides by the ocean. Originally the area that is now Nahant was used by Lynn’s residents for sheep, goat, and cattle grazing, then it grew into a maritime community with a small population dedicated to fishing. 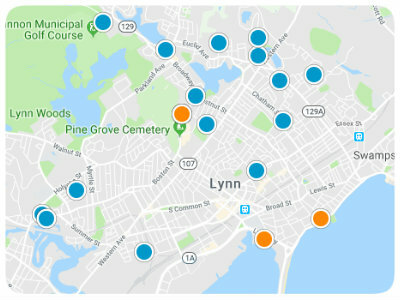 Comprised of 15.48 square miles, by the mid-1600s Nahant had been divided into equal lots for Lynn residents with the agreement they would clear the wood of their lots within six years. This requirement effectively stripped all of the first-growth woodlands from the community. Eventually, the town grew to be a resort mecca, and in 1803 the first hotel was built, and by 1817 a steamboat was making daily trips from Boston to Nahant. A Nahant Hotel stagecoach was connecting twice each day with stagecoaches running between Salem and Boston by 1826. Aside from tourism and agriculture, the other primary businesses were fishing and shoe shops, and up to 1830, there were very few year-round residents. It became the most expansive hotel complex on the Atlantic Coast and was incorporated as a town in 1853. However, by the end of the 19th century, there was a noticeable shift toward residences and away from hotels and around 1870 the development of Nahant skyrocketed. Today there is no industrial or farming activity in Nahant, but it has preserved its residential status. Prospective homebuyers considering buying a primary or vacation home in Nahant will certainly not be disappointed with the available real estate. When considering the home options of Nahant, the proximity of amenities and attractions should be considered. At 1 Nahant Road, there is a very popular attraction, Lynn Shore and Nahant Beach Reservation. Open from sunrise to sunset from the month of May through October, the reservation provides opportunities to sunbathe on the beach, swim in the Atlantic Ocean, and launch a boat. Along Long Beach there is free parking from 8:00 am until 6:00 pm and there is street parking on Lynn Shore Drive. Aside from these free options, the daily parking fees are $10 for Massachusetts residents and $20 for non-residents. Beyond the recreation activities mentioned above, the reservation also provides opportunities to enjoy picnic areas, a scenic viewing area, a playground, athletic fields, and a bandstand. You can hike, bike, walk, run, fish, kayak, canoe, and play soccer, baseball, and tennis. There is a delightful visitors’ center, a first-aid station, and showers, and the beach is accessible with beach wheelchairs on hand. From April 1st until September 15th pets are prohibited, as is alcohol year-round. Though this attraction is far more popular in the summer months, it is a fabulous destination throughout the year. With so much to offer, Lynn Shore and Nahant Beach Reservation is a destination which every homebuyer would love to live near. If you would like to learn more about homes for sale near Lynn Shore and Nahant Beach Reservation, please contact us so we can assist you.